"Suspense, psychology...and a touch of the bizarre." A longrunning, acclaimed serial launched in 1997 focusing on the twisted psyches and self-destructive behaviors rife within a tight-knit community. Interwoven storylines spotlight sexual obsession, clever mysteries, black humor, gothic suspense, overseas adventure, touching romance, family drama, organized (and disorganized!) crime, and heartbreaking angst. If you loved Twin Peaks, American Gothic, Picket Fences, and classic, character-based soap opera storytelling, you’ll love ASF. Dive in ... and don’t be afraid of the dark. Despite its lengthy history, you can dive in at any time thanks to easily accessed character bios, setting descriptions, and episode/plot recaps. Also, readers can vote and play a role in the future lives of their favorite (or least favorite) characters. About Schuyler Falls has not been tagged yet. 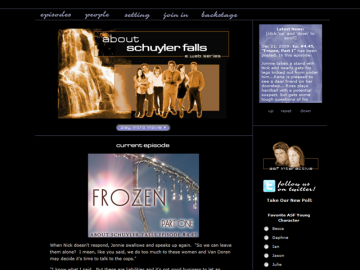 Help others find About Schuyler Falls by tagging it! About Schuyler Falls has not been reviewed yet. About Schuyler Falls has not been recommended yet.